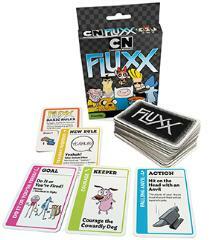 The awesomeness of Cartoon Network's greatest hits teams up with Fluxx, the Card Game of Ever Changing Rules to create a truly best-selling game! Fluxx's unique gameplay makes every game different. Play cards that change the rules and collect up cool Keepers that combine to meet the current Goal - but do it quick before someone changes the Goal card!